Posted in: 1 Pageant Pages, 2 Shout-out-Looks. 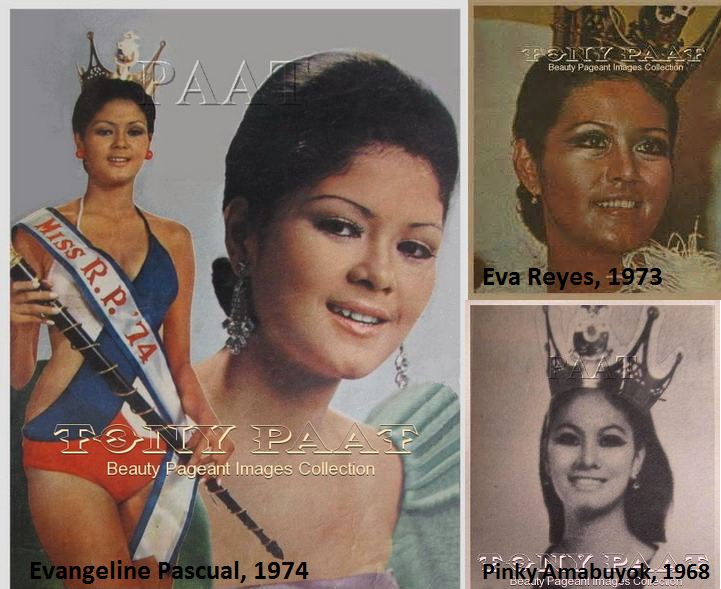 Tagged: Eva Reyes, Evangeline Pascual, Miss America, Miss Republic of the Philippines, Miss Republic of the Philippines 1973, Renee Salud. The latest buzz in local pageant circles at the moment is the plan to revive Miss Republic of the Philippines. But unlike the original which served as the national finals for the country’s Miss World representatives from 1966-1976, the new version will be patterned more after the Miss America Pageant which is purely a scholarship competition with no mission to vie for an international crown. And this could really be an excellent foundation for beautiful and intelligent Filipinas who are just waiting for the solid opportunity to further their education (be it in the undergraduate or masteral levels) while promoting their individual advocacies. Bright minds, outstanding talents and service-oriented hearts will hug the spotlight this time around. And the prospects are really exciting me. For a change, I would rather armchair-judge a lady without being compromised by the dictated profile/s of a particular global contest.